2017 Reissue on Black Double Vinyl ! 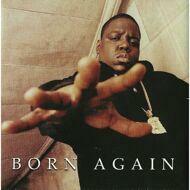 Born Again was originally released December 7, 1999 and has been out of print since the early 2000s. It debuted at #1 on the Billboard 200 charts and solve over 485k albums in the first week of release. Guest artists include Busta Rhymes, Redman and Method Man, Missy Elliott, Ice Cube, and Snoop Dogg.